The higher end of photography is where you’ll find the sexiest kit. Full-frame, metal-bodied cameras that will survive the apocalypse, and create crystal-clear images at even the most stratospheric of ISOs. Still, for every job that actually calls for a camera worth more than many cars, there are just as many photographic assignments that could be shot on far more affordable equipment. Digital cameras have been capable of stunning results for years now. That’s great news for the rest of us, because it means there’s loads of kit out there compatible with high-end lenses or lighting equipment, which can create images limited only by your imagination. You might also be surprised by the features you can get on cameras that’ll set you back £400 or less – Full HD and 4K video modes, surprisingly fast continuous shooting, and connectivity that includes Wi-Fi, Bluetooth and NFC. The drawbacks to shooting with cheaper equipment are actually few and far between. If you desperately need to shoot 4K video at very high frame rates, or you want 15fps RAW shooting, or a camera you can drop down the Grand Canyon and pick up again at the bottom, still working and in one piece, you’ll want to spend more. But for even the most passionate photographers, saving a few bob on a camera won’t necessarily result in worse images. It will, however, leave you with a few bob to spend on taking your new pride and joy somewhere interesting. It used to be that any roundup of cheap cameras came with a list of compromises as long as your arm – but these days there’s an impressive choice. That means, just as you would if you were spending twice as much, you’ll need to think carefully about the exact features you want. Thank goodness for us. At the high end of the camera market, sensor sizes are either large or very large: APS-C or full-frame respectively. A full-frame camera has a sensor roughly the same size as a rectangle of old-school 35mm film, which gives it superb light-gathering abilities but adds dramatically to the cost. At the lower end you won’t find any full-frame cameras. Instead, most interchangeable lens snappers have APS-C sensors, which has an area about 2.6 times smaller than a full-frame sensor. The smaller component allows for a cheaper camera and – usefully for those using telephoto lenses, means every lens you attach to an APS-C camera has about 1.5x the focal length that it would on a full-frame camera. Other cameras, such as bridge cameras, have even smaller sensors, but concomitantly longer lenses. Expect less well-defined images from smaller sensors, though, as well as poorer performance at high ISOs. Autofocus modes are definitely not created equal. If you’re a fairly sedate photographer – the odd landscape here, a well-lit portrait there – sophisticated autofocus isn’t too important; just ask owners of the original Canon EOS 5D. However, if you know you’ll be shooting demanding subjects, like anything in poor light, or simply subjects that move around a lot, it will pay to know your autofocus. Clearly, the number of autofocus points a camera has is important, but the type of autofocus point in question is also instructive. Phase-detection autofocus tends to be more accurate than contrast detection, particularly when it comes to moving subjects. Let us state the blindingly obvious: if you want to play with a plethora of lenses, you need an interchangeable lens camera. This will let you attach cheap-and-cheerful 50mm f/1.8 lenses, ten-grand super-telephotos, and everything in between. If you end up looking at cameras with fixed lenses, it’s worth asking yourself what you want to shoot. If it’s sports and wildlife, a bridge camera will offer greater telephoto reach than practically anything on even the most expensive of lenses; if it’s portrait, it’s worth sacrificing zoom in favour of a fast maximum aperture. 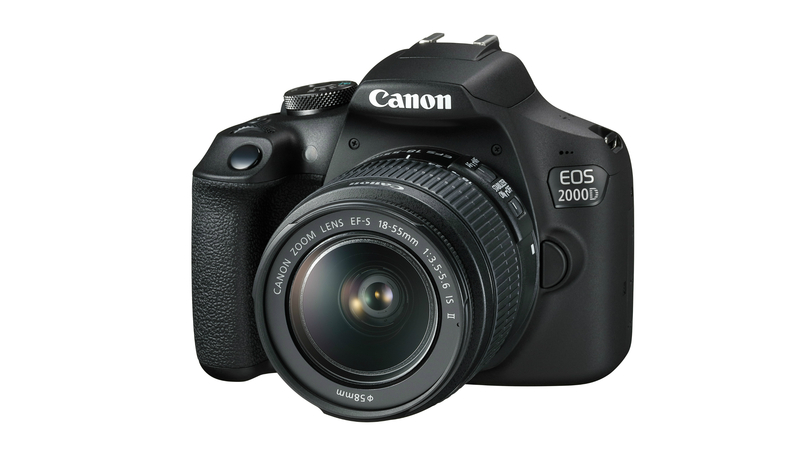 At under – now well under, actually – £400, the EOS 2000D offers a superb amount of bang per buck for the on-a-shoestring photographer. A fair chunk of that bang comes courtesy of Canon’s amazing range of amateur and pro-level lenses, as well as compatibility with lenses from third parties like Sigma and Tamron. Whatever you want to shoot, you’ll be able to find a lens that fits the bill. You also get Wi-Fi which, in conjunction with Canon’s Camera Connect App, gives you a huge range of untethered possibilities. The sensor reaches 24.1-megapixels and delivers superb image quality. The compromises are few and far between, which is impressive for a camera of this price. The screen on the back is fixed, but is high-resolution, while the maximum ISO of 12,800 isn’t record-breaking but will cover you for almost all types of photography. Movie-makers might be wary of the lack of a microphone jack, while those with an eye on sports should beware the maximum continuous shooting speed of just 3fps. Otherwise, this is a superb bargain at its current price of £369. 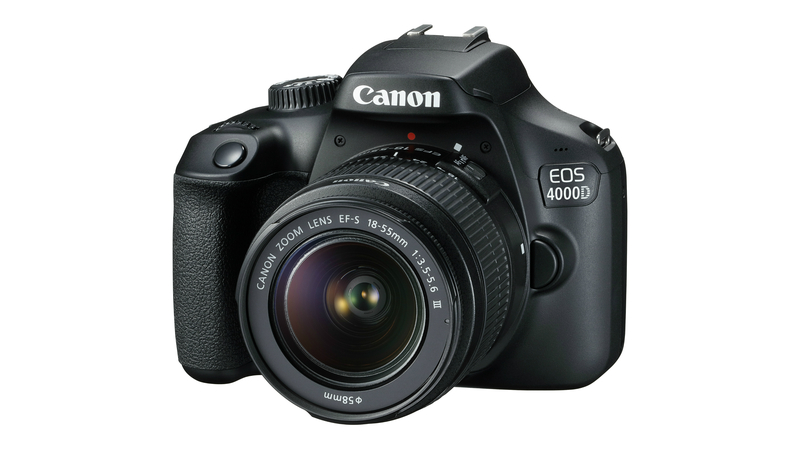 When we last reviewed the EOS 4000D, in our Best Entry-Level DSLRs roundup, we marvelled at Canon’s ability to make a camera for just £350. Well, don’t look now, because somehow Canon has managed to shave fifty notes from the 4000D’s launch price, and you can bag a Canon DSLR, compatible with hundreds of lenses, with an APS-C sensor, for less than £300. Leaving aside the question of how it’s done that, the EOS 4000D is a sorely tempting proposition. With an 18-megapixel sensor (more than enough), Canon’s bargain-basement camera allows plenty of room for learning and growth without breaking the bank. It offers excellent image quality and is a great way of getting into manual photography, while offering an obvious upgrade path for those who get the bug. It’s even got Wi-Fi. If you’re buying one, do it with your eyes open, though, because there are compromises galore. The screen is hardly luxurious, at a tight-feeling 2.8in and with a blocky-looking 230k pixels. The lens mount is plastic rather than metal, adding to the pound-shop feel. It’s not just physical features: put the pedal to the metal and you’ll find the 4000D more Lada than Lamborghini: it can manage a wheezy 3fps in continuous mode, and only for a maximum of six frames in RAW. You’re not going to see many of these along the side lines at the Olympics. But, give the specs sheet a good read before you slap down a credit card and there’s a huge amount to like here: not least, a camera that shoots great images and is part of Canon’s huge stable in DSLR cameras, lenses and accessories. One thing that often gets lost amid the hoopla of a new GoPro release – you know, the skydiving, swimming with sharks and other adrenalised activities – is that GoPro’s cameras are actually very good value. A shade under £250 for arguably the market-leading action camera? Don’t mind if we do. The Hero7 Silver is perhaps the sweet spot of GoPro’s current range. 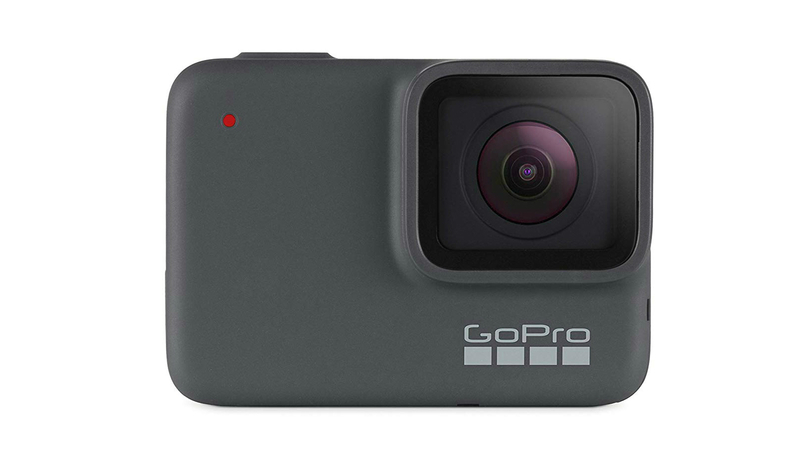 Slightly more limited than the Hero7 Black but significantly more capable than the Hero7 White, the Hero7 Silver is GoPro’s go-to for amateur – or up-and-coming – action auteurs. You get 4K video capabilities, albeit at a relatively limited 30fps (rather than the slow-motion 60fps of the Black edition), or up to 60fps at 1080p. You can also capture 10-megapixel stills, and framing up is made easier thanks to the 2in touchscreen on the back. It’s a clever – and tough – little device. It responds to voice prompts and includes GPS, including GPS “stickers”, allowing you to thrill your audience with live altitude and speed overlays. It’s waterproof to 10 metres straight out of the box, so there’s no need to fuss around with waterproof cases. Image quality is good rather than great, so those committed to great-quality, giant-format prints should stick to cameras with larger sensors than the tiny component found in this device. The Hero7 Silver offers “wide dynamic range”, a less sophisticated version of the HDR (high dynamic range) sported by the more expensive Black edition. Even so, with no opportunity to edit RAW versions of your images, stills photography on the Hero7 will almost always be an afterthought rather than the thing you buy the camera for. However, if you frequently find yourself in places where delicate DSLR cameras fear to tread, can stand acceptable, rather than incredible, image quality, and want to shoot a little 4K video while you’re at it, they don’t come much tougher than this. If you’re in the market for a decent camera, don’t think that budget DSLRs are the end of the matter. 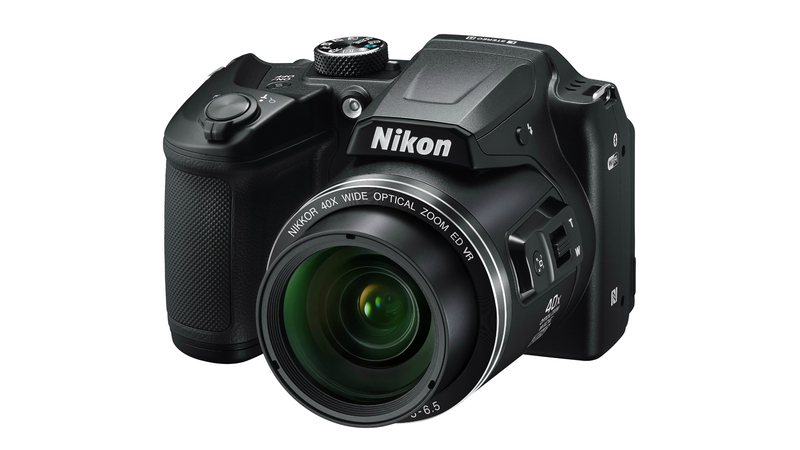 The Nikon Coolpix B500 will set you back a mere £200 and, for those who want to photograph Things That Are Far Away, could hardly do better for the money. That tiny 16-megapixel sensor might not be the last word in low-light performance, but because of its magnification factor it can offer an incredible focal length equivalent to 23-900mm on a full-frame camera. Google “800mm DSLR lens” to see just how useful Nikon’s 542g package has the potential to be. A continuous shooting mode of 7.7fps should, theoretically, reduce the chances of missing a shot. Lost, presumably, in the quest for that tempting price, is a viewfinder, so you’ll have to frame everything using the 3in, fold-out, 921k-pixel monitor on the back. That’s more of a pain than you might think, as holding a camera steady with a 900mm lens is tough at the best of times – and that’s doubly true when you’re holding it away from your body so you can see the screen. Battery life bears a mention: in a world where mirrorless cameras are forever depressing expectations of camera battery life, the B500’s ability to shoot over 1,200 images on a single charge is truly welcome. True, you’ll need to add a set of lithium AA batteries to the cost of the camera, but a set of 2,500mAh Duracells returned over a thousand frames in our tests, so it’s a small price to pay. Frequent travellers to only occasionally-electrified locations should pay attention to this long-range bargain. Nikon’s entry-level DSLRs have found favour with us for years. 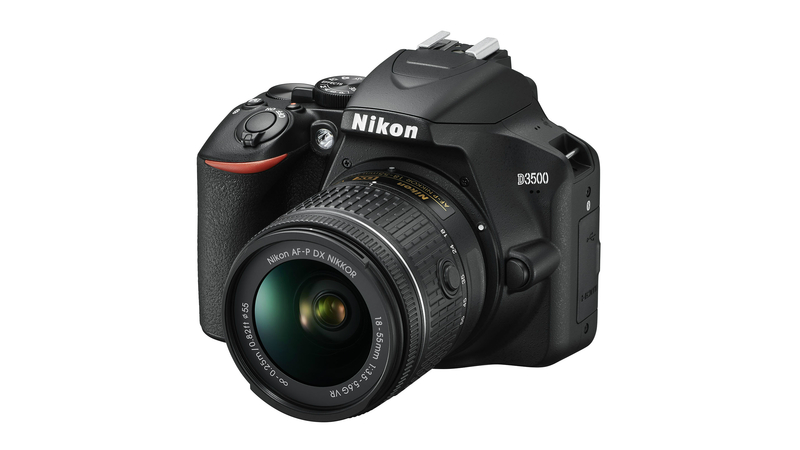 A great combination of value, features and performance constantly sees them scoring top marks, and even in this company, where its £419 price makes it substantially more expensive than some of its competitors, the D3500 is well worth considering. For one thing, it’s a fantastic camera for travellers. Capable of delivering 1,500 shots on a single charge, it stands head and shoulders above much of what else will be on your shortlist. It also feels well-built, and comes with Nikon’s excellent Guide mode, which helps out new photographers by explaining key concepts and terminology right on the excellent 3in, 921k touchscreen. It’s a very useful little feature. The 24.1 megapixel sensor delivered superb results in our tests, with noise supremely well controlled up to ISO 800 and with usable, if not stonking, images thereafter. It shoots at up to 5fps as well. Those who want to shoot video are well catered for. You might not get 4K, but you do get gorgeous results when using the camera’s maximum 1080p resolution. You’ll want to add an external audio recorder if you’re serious, though, as the D3500 doesn’t offer an external mic jack. If you’re after compatibility with a fantastic lens library and want a current generation camera capable of returning beautiful, ready-to-print results, the D3500 is a great, hugely affordable option. One thing bargain-hunting photographers love to carp on about is the maturity of the modern photography market. 15 years ago, when digital was in its infancy, the difference between one generation of camera and another was so great that you had to keep up to date, or risk being left behind. Now, a ten-year-old camera can offer – to some photographers – just as much bang per buck. 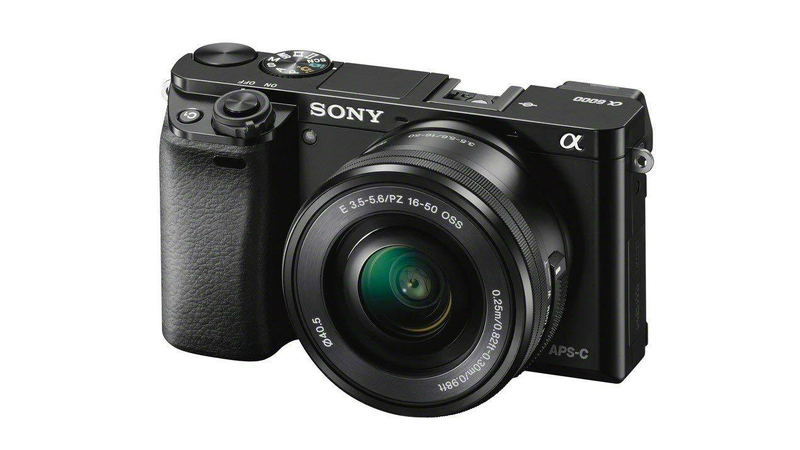 So a camera merely half that – the A6000 is approaching its fifth birthday – is surely worth a look. It’s a banger of a camera. There’s stacks of resolution courtesy of its 24.3-megapixel sensor, and the E-Mount is compatible with a lovely range of both high-end and affordable lenses. The hybrid autofocus system, comprising 25 contrast-detect points and a whopping 179 phase-detection points offers a turn of speed only matched by the A6000’s continuous shooting ability, which we measured at 11.1fps – with continuous autofocus. It knocks out great images, too. Noise is well controlled to ISO 1,600, and isn’t overly problematic up to ISO 6,400. That’s largely thanks to the large APS-C sensor, where Sony’s expertise at building image sensors is writ large. Its video mode is good, too: there’s no 4K but there is Full HD at either 50 or 25fps, with a few video-friendly touches such as zebra-striping for highlight alerts and focus peaking. You don’t get a mic-in jack but could always add Sony’s ECM-XYST1M hotshoe mic, which (apart from actually being a microphone) includes an audio-in minijack. For a camera of its age, there are an impressive number of mod cons. You get Wi-Fi, for example, and NFC. The monitor on the back is a large, 3in, 921k-pixel number. Despite its age and bargain price, this feels like a thoroughly modern camera – and that’s before you start using it.